Max awoke at 2:45am on March 18th to the sound of my shuffling slippers. I was 39 weeks and one day pregnant, standing in the kitchen grasping cheddar cheese, crackers, and a knife, my attempt at a midnight snack. I had been timing contractions since 2am when I finally realized I couldn’t sleep and would instead get some food. 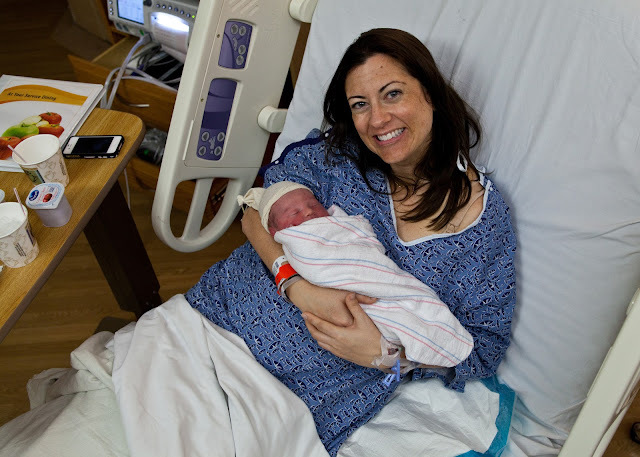 The contractions were coming ten minutes apart, but to me it was nothing new – I had been losing sleep over contractions for the past week, though they had never before brought me out of bed. Max gave me a kiss, instructed me to be careful with the cheese knife I was wielding, and headed back to our bedroom. Max lasted maybe fifteen minutes in bed before he was back by my side, claiming he knew it would be a no-sleep night. He must have subconsciously known that this was it. I, on the other hand, was blissfully oblivious. I remember walking around the den, the dining room and the kitchen island, reminding my husband that walking is supposed to stop false labor. It just didn’t register with me that, since the contractions weren’t stopping, this wasn’t false labor. Max took over timing duties (which we did on an iPhone app, thank you technology) and followed me around as I employed all the positions for laboring I could remember – sitting on my birth ball, leaning over the bed, hanging off of Max… I knew from our Birth Journey class that breathing was my strongest pain coping technique, so I concentrating on bringing all my awareness into my breath and breathing in and out positive messages (which I had practiced over the past nine months during prenatal yoga). Max put on my “Mande Music” play list that contained my favorite mellow music on all the house speakers so I could hear it from any room; it was delightful! Max continued on timing duty, though I wasn’t the best at recognizing the contractions. He would actually look at me and say “I’m starting the timer you’re having one” before I even knew one was starting! Looking back, we realized we also missed some, which threw off the timing. If they weren’t especially intense or painful, I thought they shouldn’t count. Because we didn’t time those ones, it looked like contractions were sporadic, coming every fifteen minutes, then seven, then fifteen. In reality, they were pretty consistent coming ten minutes apart then down to seven. Around 4:30am I announced that I wanted to labor in the tub, so Max drew me a nice bubble bath. At that point the contractions jumped way close together, maybe every three minutes. I got a little anxious, thinking we might have to make a speedy trip to the hospital, so I jumped from the tub to the shower and decided to get ready for the day, even though it was still dark outside. The contractions slowed a bit again, and Max assured me we had plenty of time at home before we needed to head to the hospital. I continued to labor and Max continued to be amazing. He knew exactly what to say to help me, giving me lots of positive encouragement in a nice calm voice. He would tell me that I was strong, and doing a great job. At 6:00am, Max texted both of our moms (though I didn’t know this at the time). He had already emailed into work that he wouldn’t be coming in (which I was also unaware of). Our moms were planning on flying in later in the week, and we had planned for them both to be at the birth of baby. Max said he wasn’t making any promises, but it looked like baby might come today. That was enough for both moms, who hurried to jump on the first flights to Phoenix that they could. Sunrise happened during a contraction; I remember our den being dark, then all of a sudden (many tens of minutes later to the outside world) the room was filled with light. We moved to our bedroom and tried lying down in bed for to rest, but it didn’t last long and I realized I was a bit hungry. Max gave me a banana and fixed bowls of cheerios for us. We sat at the kitchen counter munching away, believing that, possibly, baby would be born today! Around 10:30 I realized I had one last chance to get food in me before heading to the hospital where it would be ice chips only. I had heard that your appetite goes away during labor, but being nine months preggers I was used to eating a ton throughout the day so I decided to eat one more time. I heated up the steak and cauliflower puree I had made the night before. Max sat with me while I munched on it and finished what I couldn’t eat. Finally, it was time to head to the hospital! I sat, bouncing on my birth ball, in the hallway as Max packed up Pepper with our hospital bags and pillows. Around 11:00am he announced that everything was packed, Pepper was locked, and he realized the car clicker had run out of battery power. All of our things (including the backup keys and clicker to Pepper) were inside the SUV, and he couldn’t get in! Internally I was thinking: This could be bad, this could be sooo bad. Luckily, he was able to get the clicker to work to unlock one door. He crawled through to the back and retrieved the backup keys, whew! By 11:15am we were off. It was so odd leaving, with so much uncertainty lying ahead! The hospital where we would deliver was a 15 minute drive away. I had left a CD of visualizations in the SUV for the drive over, so I popped it in as we were leaving the driveway. Max had already thought the visualizations were cheesy so he (ever so lovingly) poked fun at them without being too funny. We discovered earlier in the day that, if he told jokes that were mildly humorous during contractions it helped distract me. However, if he was so funny that I laughed out loud, it made the contractions hurt even worse. Between Max’s joking, and actually following the visualizations, the car ride (and the four contractions I went through) seemed to go by rather quickly. Earlier in the morning when the contractions got intense, I instinctively began closing my eyes during them. Max later said it was some sort of sensory overload thing – that the pain was so intense the darkness helped. I would continue to close my eyes during most contractions for the rest of labor. Since I had my eyes shut during contractions on the drive to the hospital, I only remember snippets: leaving our housing subdivision, waiting at the stoplight at Pima Road, the onramp to the 101, the stoplight at Shea… and then, we were there! We pulled into the hospital and were very lucky to see someone leaving so we snagged their parking spot. The hospital is usually hopping which makes finding parking difficult. Even the valet line was backed up, so we were super fortunate to be able to just park. Of course, we were in the middle of the lot, and a ways away from the entrance to the hospital. We got out and Max held my purse and my arm as we made our way through the lot. I was definitely in pain and going slowly (we didn’t know at the time, but I was dilated to 5cm!). We were stopped by a hospital worker in a golf cart asking if we wanted a ride. For me, it seemed easier just to walk so I declined. We were asked again when we made it closer to the hospital, and were offered a wheel chair as well, but for some reason I just wanted to keep walking! I remember looking at the front of the hospital and wanting one of those cute photos standing in front with my belly, however right about then I had a contraction and all I wanted to do was get in! Max and I rode the elevator to the second floor and made our way to the desk under the Family Birthing Center sign around 11:30am. Max was so sweet to do all the talking for me. They had my paperwork right at the top, and it was just a couple minutes before they called me into a triage room. The triage rooms were private with adjoining bathrooms. I got dressed in my hospital gown and waited (and waited) to be checked. 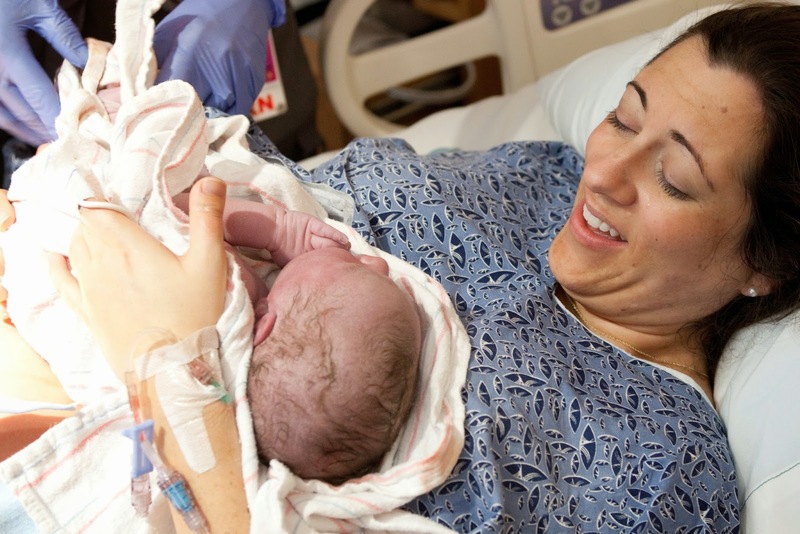 It turns out that it was a busy day in labor and delivery, and they were full. When a nurse did come and check on me around noon, she announced that I was 5cm, 100% effaced and baby was at 0 station. I was elated! 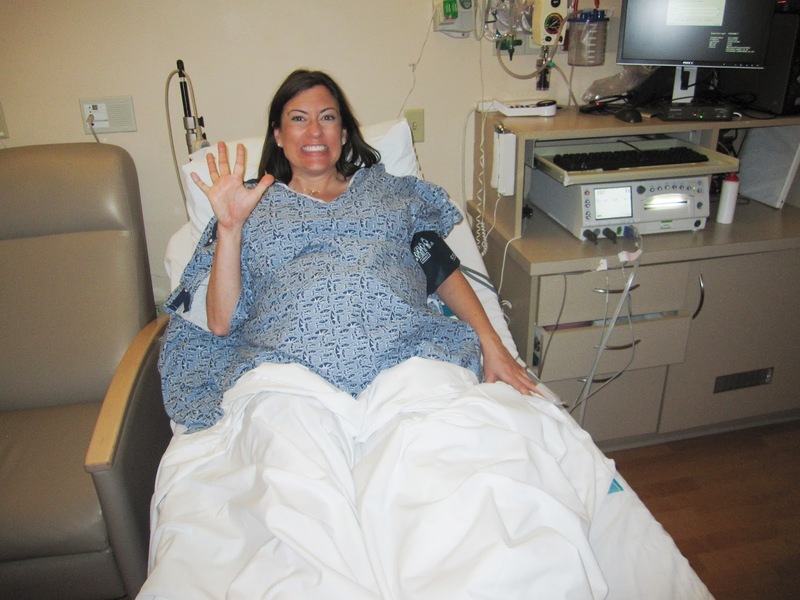 My fears of being turned away for not really being in labor disappeared – I was halfway there! 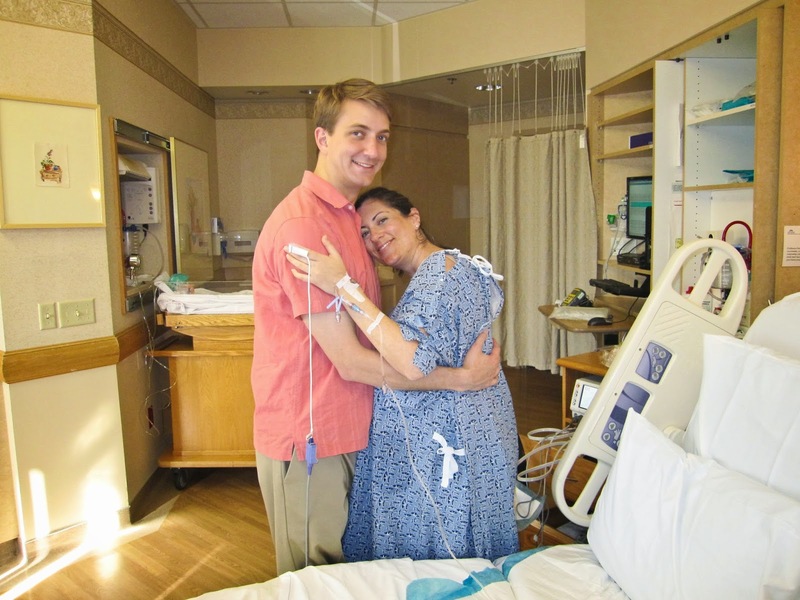 At that instant, I knew that I could do it and knew I wouldn’t need an epidural or any pain meds. The nurse said I would be able to walk around which made me even happier (laying down on the bed hooked up to the monitors made enduring the contractions much harder than when I got to be up and changing positions). The nurse left to phone my doctor, and returned with the news that my doctor did not want me to walk around (insert sad face here). I needed four hours of ampicillin to clear the Strep B bacteria in my intestines to make delivery safe for baby. 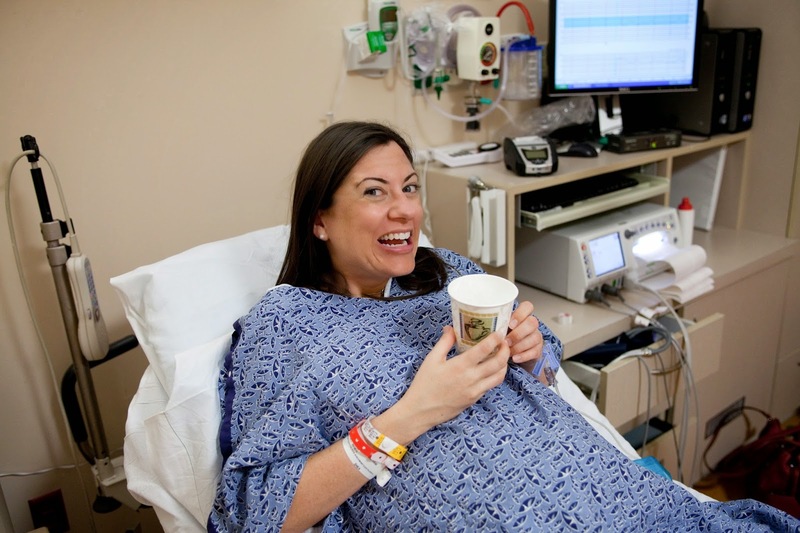 My doctor was afraid that walking around would speed up labor, and in fact I needed to slow it down to make sure I didn’t deliver before the four hours were up. The nurse even pushed an epidural, saying that it would slow down labor, which was what I needed. I declined the epidural and listened to her talk about how the needle is not that bad, and that getting the epidural really wasn’t painful. I wanted to tell her that it wasn’t the pain of getting one that was stopping me, especially since I was pretty sure that laboring through contractions was going to be much more painful than getting the pre-shot that numbs the back before the epidural catheter is inserted. But I didn’t, and just listened to her, and even signed the waiver allowing for an epidural later if needed, since I could tell she was very skeptical that I would be able to deliver without it. At that point I was admitted, and really should have been moved to a labor and delivery room but they were all full! So we stayed in triage. I was finally administered my IV and ampicillin at 1pm. I asked Max to tell me a story as the nurse worked on the IV. He told me the sweetest story of our morning, and how baby was going to come today! I had been sitting up to help cope with the contractions, and the nurse informed me that I really had to lay back so the fetal monitor worked correctly. Max said this was the one time during labor that I got a bit cranky. Apparently I flailed my arms after the nurse had left and said that I didn’t like being hooked up to the IV or having to lay down. In my defense, laying down really did make coping with the contractions so much harder, and who would want to be hooked up to an IV? I discovered though, that going to the restroom did allow me to stand up and walk so I did this a few times (with Max there to unhook the monitors and move the IV stand for me – best husband/labor coach ever!). A bit after 2pm, our moms walked into the triage room! Max had arranged for a car to pick them up at the airport and take them to the hospital. We were so incredibly happy that they were able to make it in time. I said hello and then heard Max saying “Oh, she’s having a contraction!” We visited with our moms, and I remember getting sad that I was not in an actual room and did not have ice chips! So Max’s mom went out to get some from the galley and returned with a nice cup of them (which made me twelve kinds of happy), and the news that my room was ready and that we were just waiting on the nurse! Sometime after 3pm my new nurse came in and said it was time to move to my room! I remember it seemed to happen so quickly. We had to make our way down the hall and the nurse moved my IV stand while Max brought all of our things. We didn’t know at the time but I was already entering the “transition” stage of labor, where contractions are intense and close together. The nurse kept asking if I wanted to stop walking and take a break, but I wanted to power through! Once in the labor and delivery room, the contractions stepped up and were so much closer together. My new nurse gave me the go-ahead to stand up while laboring, which made me so very happy! I began relying a lot on standing and literally hanging off my husband to work through the contractions. During one especially intense contraction, I heard my mom tell Max’s mom “look at his arm!” Apparently, I had begun griping Max’s arm to cope with the pain, so much that it was turning white, oops! Luckily he didn’t complain. My new nurse checked me to give an update to my doctor and I was 8-9 centimeters. She and another nurse who was in the room seemed very surprised I was this far along and started congratulating me on not having any pain meds, saying “You did it!” I remember saying “Well, I haven’t done it yet!” They replied that I was almost there and it was going to happen. They relayed the news to my doctor, who was stuck in rush hour traffic. I continued laboring and at some point Max’s coaching and words were needed to help me with my breathing. Up until that point, I could do my yoga breathing on my own, but the pain became so intense that it made it hard to concentrate without his coaching. My sweet mom chimed in with very stern words to breathe, breathe!! She later told me that she was afraid that I was going to pass out. At the time, though, I just could not take any harsh coaching. Maybe it’s the first grade teacher in me, but any motivation that is not calm or reassuring just makes me upset. I would totally cry if I ever tried to do one of those Jillian Michaels workout DVDs where she yells and screams that you can do better. During one contraction I actually shook my finger at my mom, my way of saying this is not helping, as I couldn’t speak. The contractions at this point were coming every couple minutes, and, as my eyes were closed during them, I had very little time with them open! I kept saying over and over that I was sooo hot, so my mom and Max cooled me down with the refrigerated aromatherapy cloths I had brought (lavender and peppermint!). I remember my mom standing right by my side and keeping them coming - it was sooo helpful! I had made the cloths ahead of time by dipping washcloths in water and aromatherapy oil, then rolling them and wrapping them in saran wrap like you would find at a spa. I didn’t test them out, though, and apparently I used way too much oil as the scent was super, super strong! 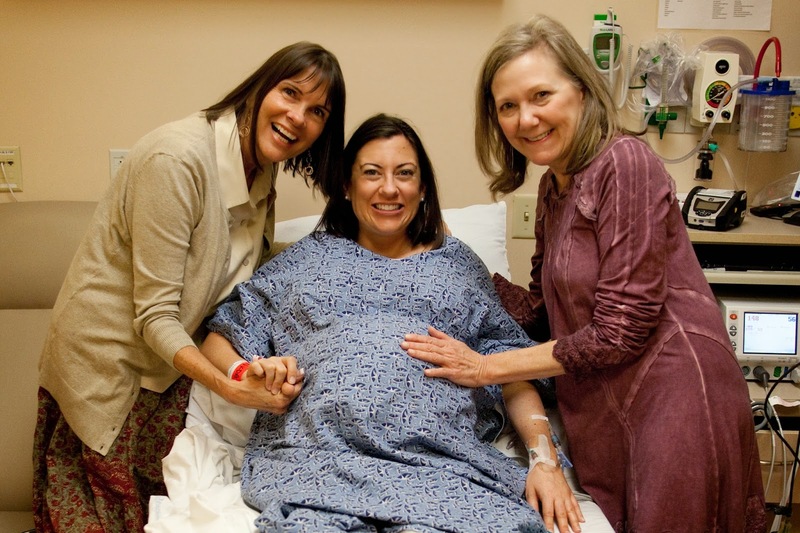 I was enduring one of the “pushing” contractions when, all of a sudden, there was a huge gush of water, similar to a huge water balloon popping. Yes, it was my water breaking! I had labored all that time and had pretty much forgotten that it hadn’t ruptured yet. Max was by my side (as he was for the entire day) and luckily he has quick reflexes and was able to side step the explosion and stay clear of amniotic fluid! My water literally shot off the end of the bed and onto the floor, several feet away! My doctor walked in shortly after and I remember telling her that my water breaking hurt! I was so disappointed, as I had been told this was the one thing that didn’t hurt. She explained that it happened during a contraction, and baby’s head was suddenly pushed forcefully down after the water broke so those were the causes of the pain (not the actual rupture of membranes). Unbeknownst to me, there was a whole team of medical staff prepping and gathering right outside the door, because I was about to be given the okay to push. My doctor checked me and said that I was ready to go! I endured maybe one more contraction, and then with the blink of an eye, the room was full, baby gear was brought in, the end of my bed disappeared and my doctor said that I could push. It all seemed to happen so quickly! Max was on my left and my nurse showed up on my right. I always thought I would be a good “pusher” but it turns out I was lousy at following directions! Perhaps it had something to do with the immense amount of pain I was in, or that my eyes were closed and I wasn’t fully paying attention to what everyone was telling me. I was supposed to be holding my legs a certain way, pushing my chin to my chest and curling forward. Instead, I was arching my back, something your body naturally does to cope with the pain, but something that makes pushing less productive. Max and my nurse helped by holding my legs in place, and at one point my nurse said I had to open my eyes to look at her and listen (I think I was a better direction-follower after that!). Max was watching and kept saying over and over how amazing it was. The pain, however, was hands-down the worst of my life, but I kept trying my best to follow along and push when I was told. Max let me know that he could see baby had a head of hair, which was absolutely surreal to know something like this before baby was actually born. I definitely let out a few screams from the pain, which I hadn’t done the entire day. (Max had actually commented earlier that I hadn’t so much as said a bad word). My doctor started being very firm with her coaching about the pushing, saying I had to get it done. I didn’t know at the time, but baby had passed meconium while I was pushing, which sometimes means baby is in distress. Finally, my doctor said that it was the “ring of fire”, that I had to just push through it and that I was almost there. I looked down and could see our baby boy was blue, which in my dazed state seemed normal. I also didn’t think twice about him not crying, but I later found out that both our moms were worried. It turns out that baby had a knotted umbilical cord which must have tightened during the pushing process. Luckily, once I started pushing, he was delivered very quickly! 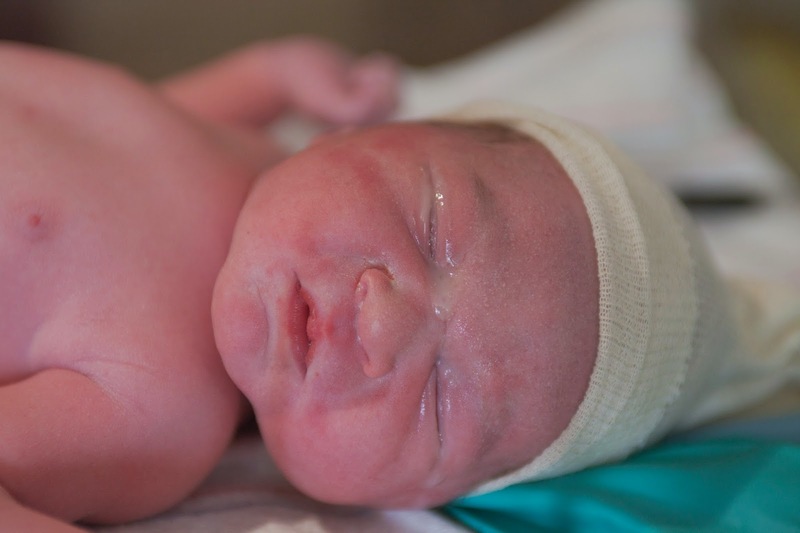 His one-minute Apgar score was an 8 (and later his five-minute would be a 9), so all was well. 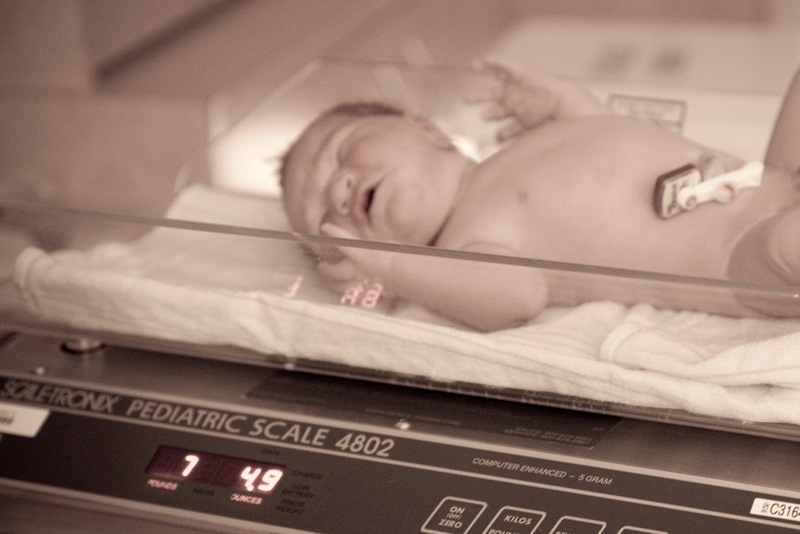 My doctor unknotted the cord as they roughed baby up on my stomach and we heard his sweet cry. They put him right on my chest and it was the most amazing and unbelievable moment! I was completely in shock and at the same time overjoyed. My doctor asked if he had a name and I looked at Max and said “Parker” – the first time our little boy heard his name! Max then cut Parker’s umbilical cord, and soon after the nurses took him over to get cleaned up and to be given his newborn shots. Max stayed right by him and rubbed his cheek, which stopped his crying. 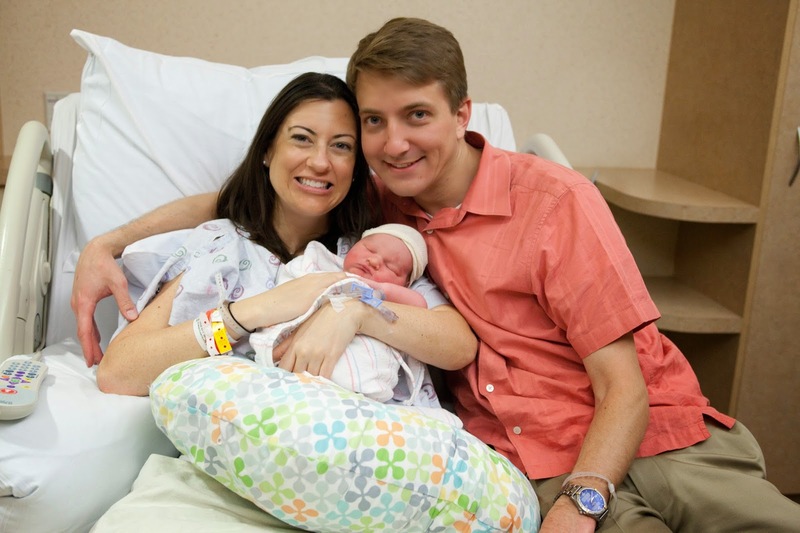 Parker weighed in at 7 pounds, 4.9 ounces and measured 20.75 inches long. They wrapped Parker in a blanket and brought him over to me. I just could not believe that my husband and I made him. He was absolutely perfect, and absolutely the most precious being I had ever seen. We were instantly so in love with Parker. We just kept saying over and over that we couldn't believe he was ours; we couldn't believe that we got to keep him. What an amazing story! I can't believe you did it without any pain medication! That is absolutely amazing. I am so happy for you and your new little family! Thank you for sharing your story! I LOVE birth storys...each is so magical! Thank you for sharing yours. Parker has one strong mama :) I am proud of you! Wow! Great job Mande! So happy your moms got to be there. He is a beautiful little boy! Such a beautiful story. Congratulations! What a great story. You are one strong mama for going thru that without any pain meds.!! !